Facts Can't Trump Politics In Immigration Debate ANALYSIS: Illegal border crossings are down, and so is border-state violence. But in a critical election year, with control of Congress at stake, the immigration reform debate isn't getting any less heated even as more facts come in. A major national survey has found that the flow of unauthorized immigrants into the U.S. has slowed dramatically over the past five years, leading to the "first significant reversal" of growth in their population in two decades. 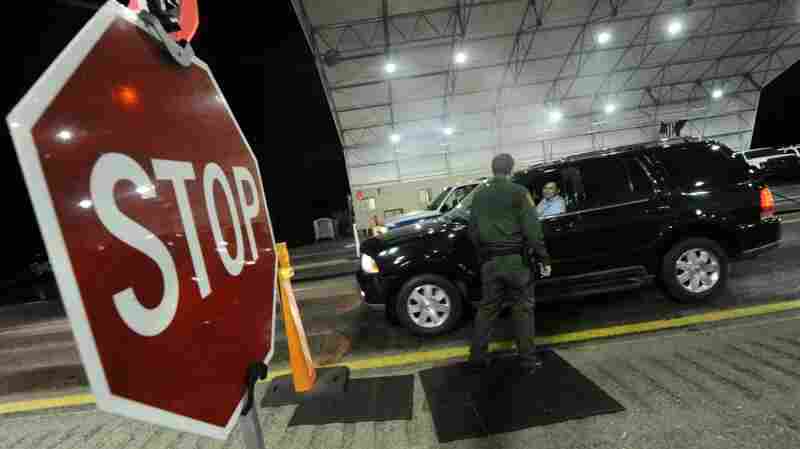 Border security has benefited from an infusion of federal money. 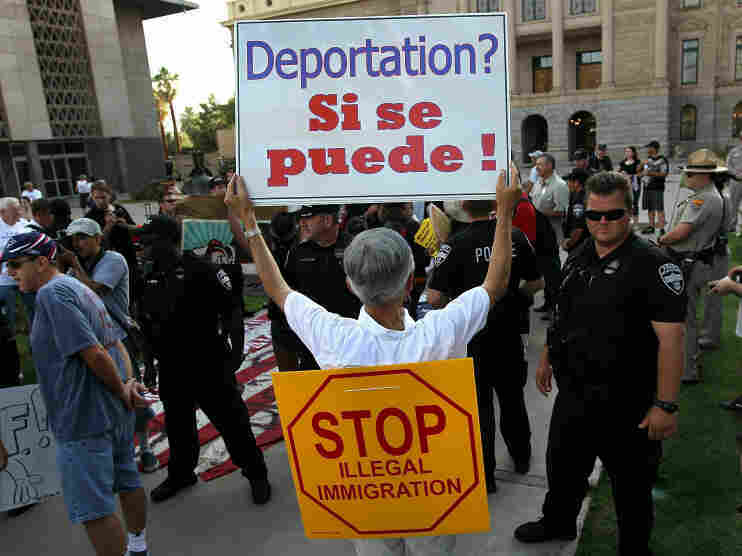 Deportations of those in the country illegally are up. FBI statistics point to a consistent drop in violent crime rates in U.S.-Mexico border towns. And Arizona Gov. 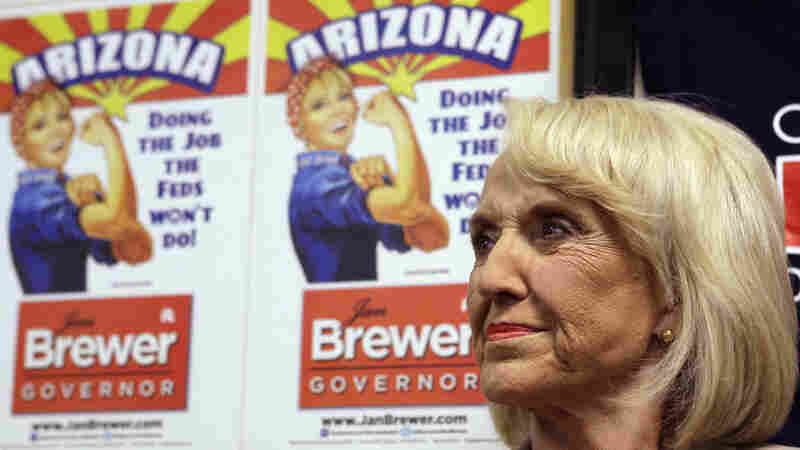 Jan Brewer -- the high-profile Republican proponent of the state's controversial immigration law -- has acknowledged that her incendiary and debunked claim that headless bodies had been found along the border in her state was "an error." Could it be that the country is moving toward what immigration expert Audrey Singer of the Brookings Institution has hopefully noted could be a "moment of reflection" in the emotional and often fact-free national discussion on illegal border crossings? Time For A Smarter Debate? It would seem an opportune time for a smarter debate on the issue: Signs are pointing to stabilization on the border, as evidenced by the Pew Hispanic Center survey, and a still-sputtering U.S. economy and high unemployment continue to contribute to the over-the-border slowdown. Estimates suggest that the U.S. economy has lost 8 million jobs in the downturn, including 4 million manufacturing and construction jobs over the past three years. Pew Hispanic Center survey on "unauthorized immigration flows"
Says Galen Carey of the National Association of Evangelicals: "There's a good argument for this being a good time to address immigration reform -- precisely because crossings appear to be down." "After all," Carey says, "you don't try to fix a bridge during rush hour." But some experts, including Edward Alden of the Council on Foreign Relations, caution against even what might be fairly described as rational exuberance over the recent developments. "I would like nothing more than to wish that were true -- that all this stuff has started to get through to people," says Alden, author of The Closing of the American Border. "It's what I and others have been trying to do -- inject numbers and rationality into the discussion." But, he adds, "I haven't seen any evidence that it's happening." In fact, what has unfolded is an effort by some Republicans on Capitol Hill to take up, with at least an election-year show of seriousness, calls to re-examine the Constitutional right to citizenship for those born on U.S. soil. It's a move that targets children born to undocumented immigrants. In other words, say Alden and others immersed in the immigration debate, despite evidence to the contrary, the visceral will likely continue to trump the factual as long as it remains potent political fodder -- as it does now, going into the mid-term elections. Stoking those fires, critics say, detracts from the very real and more pressing border issues: Mexico's violent drug wars over an illegal trade fueled by American appetites and dollars. Brewer, appointed to replace Janet Napolitano when she left to become President Obama's Homeland Security secretary, is running for a full term as governor. 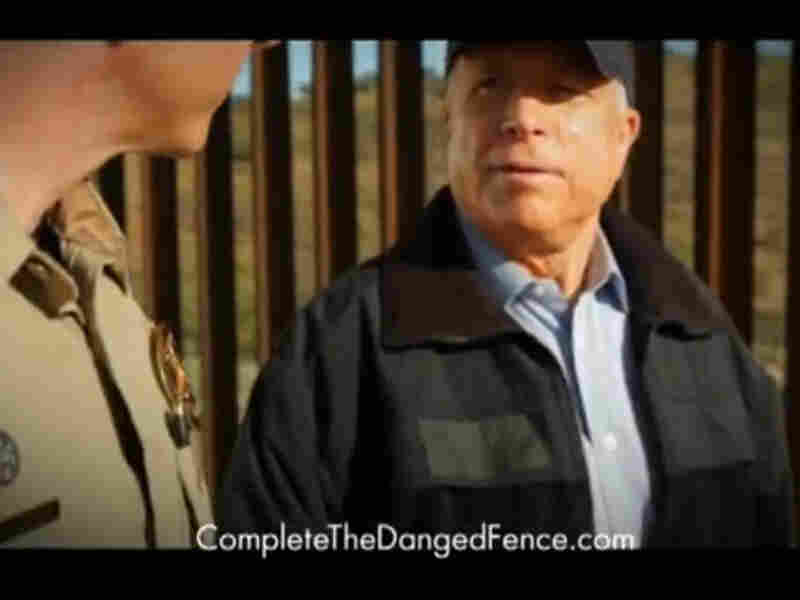 Her fellow Arizonian, Sen. John McCain, a Republican once seen as a powerful voice for comprehensive immigration reform, is running for re-election. A few days ago, during an appearance on Fox News, he accused Obama of ignoring violence migrating from Mexico to the U.S. Political circumstances, Singer says, are working against moving the discussion forward. The growing strain of nativism that has marked the pre-election politics, coupled with economic hard times, have conspired to keep Congress mired in its three-years-and-counting inaction on immigration reform. What that's done is not only prolong the uncertainty about what will or won't happen on a national level -- and prompt states like Arizona to fashion their own controls -- but also stall progress on legal immigration issues. "Everything is frozen," Alden says. "Immigration policy has become hostage to an unachievable ideal for what it means to secure the border." Delaying overhauls to the national immigration quota system means that, for example, "we're driving away thousands of skilled Chinese and Indians," he says. There has been no action on the "Dream Act," legislation proposed last year that would allow undocumented immigrant students who have been in the country since childhood to enlist in the military, go to college and earn citizenship. Even workplace verification efforts to identify undocumented workers have been hampered by the border debate, Alden says. The debate over illegal immigration will likely remain mired in politics until two things happen, experts say. Consensus is needed on the definition of a "secure border," and on what to do about the 11 million people living in the U.S. without legal status. "Realistically, we can't seal the border," Singer, of Brookings, says. "We've been modifying and building up our enforcement efforts at the U.S.-Mexico border for a long time, and there's always a call for more." And when the U.S. economy improves, she says, the "border will again be tested, and internal enforcement will again be tested." It's Alden's view that the goal should be to realize a steady decline in illegal border crossings, even as the economy improves. "I think that requires both enforcement measures and more legal visas for people," he says. "The problem is that the debate doesn't center on that -- it centers on securing the border, an impossible standard." The recent Pew survey and statistics coming from the FBI and the administration suggest opportunity to Carey, government affairs director for the evangelical association . Early this year he wrote a piece titled "Why Evangelicals Want Immigration Reform This Year." In it, he says that evangelicals "may have largely missed the civil rights battles of the 1960s, but we do not intend to repeat our mistake in 2010." He says he's not convinced that some action on immigration reform won't come up before the end of the year. "I think there's a possibility that something could be done in the current Congress -- even after this election, when a number of folks will be retiring and maybe want to have one last achievement before they leave," he says. "We need for our political leaders to take a step back from their preoccupation with immediate electoral results," he says, "and to act like statesmen." Judging from the rhetoric of recent months, however, that appears an increasingly tall order.